D-DAY MINUS – 17 SEPTEMBER 1944 est le quatrième volume de la série « Opérations », une série couvrant l’engagement des parachutistes américains au cours de la libération de l’Europe. Cet ouvrage raconte à travers un recueil de photographies d’époque, l’épopée des parachutistes américains de la 101e Airborne en préparation de la libération de la Hollande au cours de l’Operation Market-Garden. The first volume is titled « D-DAY MINUS – 17 SEPTEMBER 1944 ». The thought provoking introduction is the first concise version of the entire decision making process that lead to Operation Market Garden and the strategy behind it. 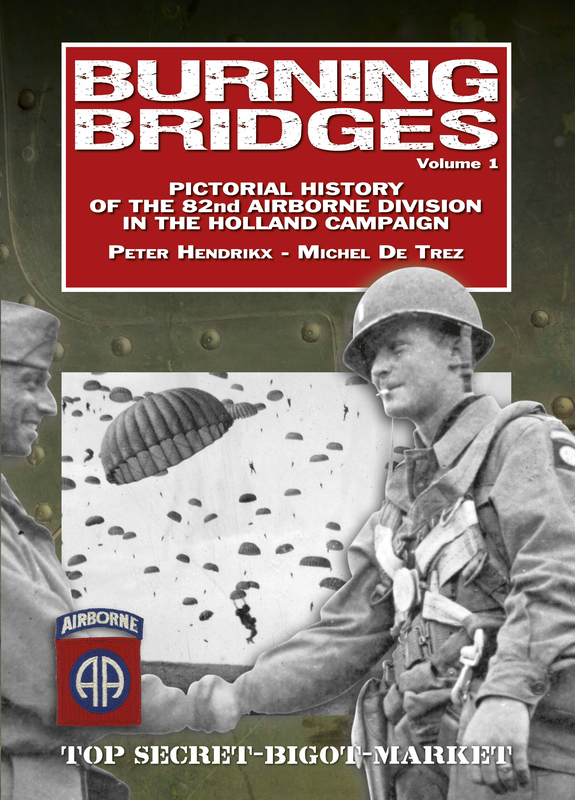 The role and organization of the newly founded First Allied Airborne Army and the preparations for the operation are dealt with in the first chapter. Next, the authors take a detailed look at the role of the four participating Pathfinder Teams which were to mark the Drop Zones and how the tragic loss of one of the teams lead to an erroneous drop. The next three chapters show the emplaning on various airbases in England of the paratroopers of the 501st, 502nd and 506th Parachute Infantry Regiment. Hundreds of unique photographs show the paratroopers and their generals : Taylor, McAuliffe and Higgins, as well as their parachute equipment. Although the main focus is on the airborne forces, the pilots of the Troop Carrier Command and their C-47 aircraft are also pictured in great detail. 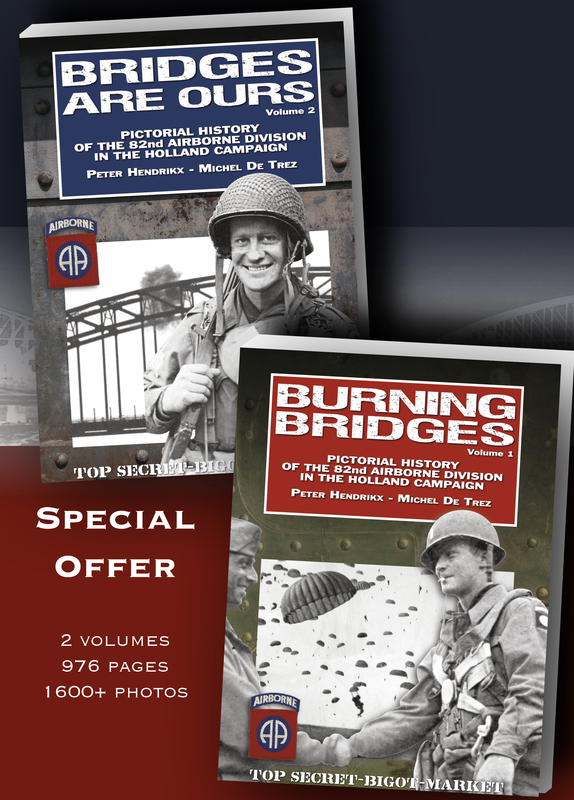 The last chapter is devoted to the preparations and emplaning of the glider echelons of the 101st Airborne Division; the 327th Glider Infantry Regiment, the artillery battalions, engineers and medics. Many photos of the glider riders, the glider pilots and their fragile canvas WACO gliders are seen and published for the first time. 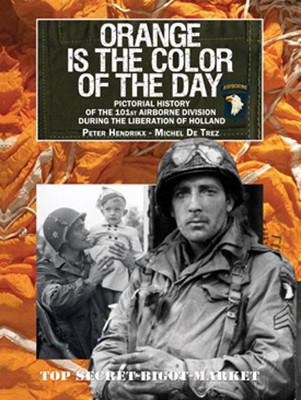 Together with the second volume, titled « ORANGE IS THE COLOR OF THE DAY », this volume offers a never before published insight in the history of the 101st Airborne Division in the Holland campaign. 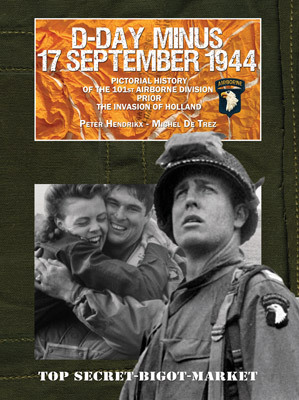 « I just wanted to thank you for the books Orange is the Color of the Day and D-Day Minus 17 September 1944. My husband was ecstatic on Christmas day and is looking forward to reading every page. 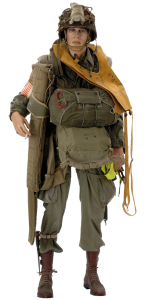 He has been a WWII Reenacter for several years and also has an extensive collection of WWII History books focusing on the 101st Airborne. 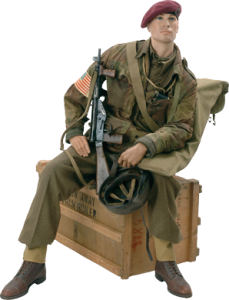 His group is based out of Columbus, Ohio and he is currently the « Captain » of this group; WWII Historical Reenactment Society, 101st Airborne Division, 502nd PIR. « Yesterday all the books arrived. To say that I am thrilled does not cover my feeling on how happy I am. They will be a big asset to my reenacting of the men from the 101st Division. « Het zijn twee prachtige boeken, met super kwaliteit foto’s! En wat ik vooral interessant vind zijn de gedetailleerde plaatsbeschrijvingen ». Ian Gardner, historian and author of « Tonight we Die as Men » and « Deliver us from Darkness ». « I went to the remembrance at Heeswijk and it was very beautiful. It’s good to remember those who fell for our freedom. I bought your books, and I just finished with watching all those photographs. It’s an awesome collection of rare and unseen photos. I want to thank you and Peter for the research and writing. Those book are of great value for the heritage of the war. With my study cultural heritage I want to show the people what the price of our freedom was. I have met the veterans, so it was an amazing day. « Je viens de recevoir les deux livres. Merci pour l’envoi rapide, ainsi que pour les dédicaces. Superbes albums !!! « Je vous envoie ce mail pour vous informer que j’ai bien reçu vos 2 ouvrages, la semaine dernière. Je vous remercie pour votre sérieux et votre rapidité. J’ai apprécié également votre dédicace. Puissiez vous continuer votre fantastique travail pendant de nombreuses années. « Books arrived today? What can I say, but? Congratulations with this awesome publication! vel, justo accumsan dapibus efficitur. ante.